Oh So Shutters was started in 2012 by a team of experts with a wealth of experience and knowledge in the shutter industry. We are proud to say we have the expert knowledge and know-how to help you make the best choice for your home. Our staff are knowledgeable and passionate about what they do. Providing excellent customer service and the best quality shutters is always our top priority. It is important to us never to over-promise and under-deliver. We work closely with designers, architects, builders, and homeowners all of whom help to give us important insight and broaden our knowledge and experience. Our highly trained fitters ensure the installation of your shutters is carried out correctly and to the highest standard, leaving your home as clean and tidy as it was when they arrived. Our surveyors will give you impartial advice as well as easy to understand information to help you decide what the best plantation shutter is for your property. We are dedicated to transforming your home so that you can sit back and enjoy your stunning new plantation shutters! We specialise in top-quality plantation shutters to fit any internal space and every interiors style, using the finest materials - premium-grade timber. We offer the smartest design advice and promise excellent value and brilliant customer care. Our design and installation teams are shutter experts. Bespoke and luxury curtains, roman blinds and soft furnishings. Handmade in Sussex and individual to your home. We visit you at home to discuss your ideas and help to create your ideal look. At Rebecca Lesley Interiors, we offer truly bespoke services in Made to Measure Curtains, Blinds and Soft Furnishings. We design and create beautiful environments for clients with premium quality soft furnishings & window dressings. We offer premium yet affordable custom made curtains and blinds. We understand that no budget is the same. Our three tier pricing system ensures we can cater for all types of budgets. You can select the style of curtain, the fabric and the method of production (hand sewn or machine) and really customize your package to suit your budget. We are dedicated to providing each and every one of our clients with the highest quality customer experience, one that is bespoke and unique to them. Rebecca our Lead Designer, manages every project from start to end making each client's experience personal to them. We pride ourselves in the time and attention-to-detail taken to produce high quality, beautifully finished pieces. Craftsmanship is at the heart of our business. We quite simply offer quality bespoke curtains that are affordably priced. Le Louvre is a privately owned independent bespoke interior and exterior window shutters specialist. The owners of Le Louvre have been successfully supplying interior and exterior shutter solutions since 2006. Le Louvre believes every aspect of your project is bespoke and needs to be tailored to your specific requirements. We encourage clients to sit down with our design consultants to discuss individual requirements and solutions, offering a tailored and personalised service. In addition we offer a complimentary design consultation in the comfort of your own home and carry a wide range of samples for these consultations. 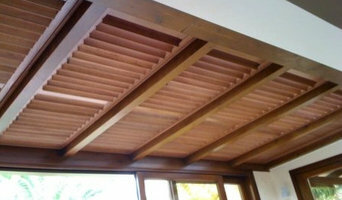 Eco-friendly Our Artisan Shutter Range is manufactured in North America. The timber used is native to North America which makes our carbon footprint very small, especially in comparison to products manufactured in factories in China or Dubai, where they import timber from North America and then ship the finished product half way around the world again. Interior Blinds make and fit beautiful, high quality blinds in your choice of style, design and material. Our blinds will add style, class and practical elegance to your home. Whether you want roller or roman blinds, wooden or venetian blinds, we've got the perfect solution for you. Our made-to-measure blinds can also be motorised for your convenience. Founded in 1992, we are based in Crawley Down, West Sussex and use UK sourced materials. We welcome clients into our welcoming showroom, which displays a large range of the blinds and finishings available. Contact us to find out how we can help! BEST OF HOUZZ 2017 SERVICE AWARD Tunbridge Wells Shutters provide bespoke plantation shutters which includes a full service from assistance in the planning of your shutters to the installation using our own fitters. All of the DIY window shutters available from us are manufactured to the highest standards and supplied at the prices up to 50% lower than other UK shutter companies. We sell the exact same ranges of shutters that other ‘full measure and install’ companies will offer you. The difference is, we sell direct to you. You measure, you install and you save £££’s. Leanne Butler has over 25 years experience working with fabrics and everything associated with soft furnishings. Specialising in hand made curtains and blinds, Tiger Lily Interiors offers a complete package to take care of all your requirements. A free consultation and measuring service is included to help you choose curtain designs, as well as expert advice on tricky and challenging windows. With a vast portfolio of fabric suppliers to choose from, TLI are also able to source poles and tracks, wallpapers, roller and Venetian blinds, to name a few. Have a chair you love which needs recovering? Tiger Lily Interiors can help you with this too. 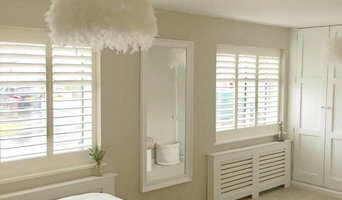 Since 2003 California Shutters has been the UK’s leading ‘supply only’ online retailer of hardwood plantation shutters. Also also offering a complementary range of quality made-to-measure wood blinds, we have sold more DIY shutters than any other UK retailer. Building upon our wealth of design, manufacturing and customer service experience, we extended our product range in 2008 to temporary blinds and solid internal shutters. Whatever options you decide best suit you, we guarantee a product designed perfectly to fit your style and budget. You do the measure and install, we offer you £££’s off your shutters. Our experience within the shutter market has allowed us to understand not only the high demand for our plantation shutters, but also our customers’ needs and requirements. It is very simple – Shutter Shack allows their customers to purchase shutters at a fraction of the normal retail price on a DIY basis. Optional Bolt on Installation service - We understand that for some people the whole idea of DIY can be very daunting. That is why we have setup our own experienced installers as an independent and trusted source, who will carry out an installation service, offering DIY shutters with a professional installation team. Luxury bespoke soft furnishings, made to measure curtains and blinds from our Surrey workroom We are a private, independent company specialising in the design and make up of top quality bespoke hand-stitched curtains, blinds and soft furnishings. to help you create the perfect home. Overseen by Susie Wigg, the team are professionally trained, and personally make your items from start to finish in our dedicated workrooms where quality and delivery can be carefully controlled. 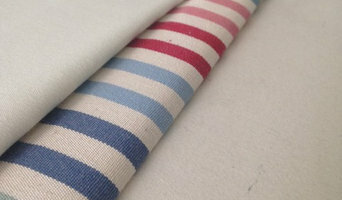 Using traditional techniques, and the very best linings and interlinings, your soft furnishings will have a lasting finish and quality which exceed other expensive High Street options. We also supply a wide range of fabrics, tracks and poles. We can bring fabric samples to your home from our extensive collections, discuss design ideas and give you competitively priced quotes all with no obligation. The fabric brands we use the most include Lewis & Wood, Kate Forman, Anna French, Thibaut, Linwood, Romo, and Designers Guild, to name just a few. Curtain makers, retailers and designers in Brighton, East Sussex can work wonders with pieces of fabric, while fitting blinds or shutters can be tricky to do yourself, so it’s definitely a wise idea to hire a window dressing professional in Brighton, East Sussex who can design, make and/or fit bespoke blinds, curtains or shutters for you. 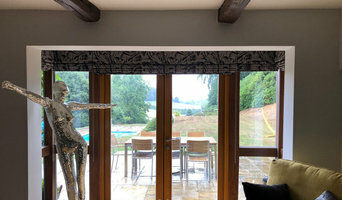 Whether you want sleek roller blinds for your home office, roman blinds for your kitchen, venetian blinds to smarten up your living room, plantation shutters for your bay windows or delicate voile curtains for the bedroom, there will be Brighton, East Sussex curtain makers, blind fitters or shutter company to help you with your ideas on Houzz. A curtains, blinds or shutters company in Brighton, East Sussex will first be able to advise you on the style of window dressing that will work with your windows and rooms. If you have an idea or design in mind for your window dressing, then discuss this with any potential experts, such as curtain makers in Brighton, East Sussex, to see if your design and style is possible. You will need to work closely with them if you are planning on having custom curtains, bespoke blinds or shutters created. Curtain makers will be able to turn most fabrics into curtains, so if you’ve found a pattern or fabric you like already, present this to your Brighton, East Sussex curtain makers and they could be able to turn it into curtains for you. Even when clients don’t have certain fabrics in mind, curtain makers can suggest fabrics based on your style and the rest of the room’s design. They can pick out the right weight, thickness, length and pattern that would suit your room. Curtain retailers in Brighton, East Sussex will offer a huge range of readymade curtains, or curtains that can be adjusted or made to order. Contact Brighton, East Sussex curtain retailers if you’d prefer to choose from a large selection of ready-to-go curtains; whether they are high-end designer curtains or just plain white curtains; rather than waiting for some bespoke designs from a curtain maker that may take a bit longer. You may find that curtain makers in Brighton, East Sussex also offer a stock of ready-to-go curtains, too, but always double check with the professional first. Once you’ve decided on a design, curtain makers, blind fitters and shutter professionals will usually measure your windows or doors to ensure a good fit. If you are having blinds or shutters made then it will probably be best to have them professionally installed, too. Blind fitters and shutter companies should offer this service with their products as blinds and shutters need to be firmly fixed to the windows; something that most homeowners don't know how to do themselves. Although roller blinds and Roman blinds can be fairly simple, vertical blinds and Venetian blinds can be a bit more complex, and if you want remote controlled blinds that operate with the touch of the button, then you definitely need to call in the Brighton, East Sussex blind fitters. Plantation shutters are substantial window dressings and need careful measurements and installation, so it’s really best to leave the measuring, design, manufacture and installation to a professional Brighton, East Sussex shutter company. Blind fitters, shutter companies and curtain makers in Brighton, East Sussex should also check the insulation of your chosen window dressing and make sure there are no potential hazards once fitted. Finally, they should confirm with you that your curtains, blinds or shutters are functioning as you’d like them to before finishing the job. What should I ask Brighton, East Sussex curtain makers, blind fitters and shutter professionals? Find curtain makers, blind fitters and shutter professionals on Houzz. Narrow your search in the Professionals section of the website to Brighton, East Sussex blind, shutter or curtain maker professionals. You can also look through photos to find examples of Brighton, East Sussex window dressings that you like, then contact the curtain retailers, blind fitters, shutter professionals or curtain makers in Brighton, East Sussex who worked on them.